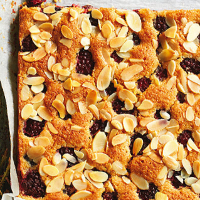 The last of the year’s blackberries can still be found in October but late raspberries (and raspberry jam) make a lovely variation and work just as well with the buttery frangipane. Preheat the oven to 180°C/gas 4. Line a 21cm x 30cm tin with non-stick baking paper. Roll the pastry out, ½cm-thick, on a lightly floured surface. Using the tin as a template, cut out a rectangle of pastry to fit its base. Lay the pastry in the tin and prick with a fork. Chill for 20 minutes. Bake for 15 minutes, until palest gold. Remove from the oven and spread evenly with the jam or jelly. Set aside while you make the frangipane. Beat the butter and sugar together until light and creamy, followed by the vanilla and the eggs, a little at a time. Finally, fold in the ground almonds. Carefully spread the frangipane over the jam in the pastry base. Top with the berries, pushing some of them down into the frangipane. Cook for 10 minutes, sprinkle with the almonds and bake for 5–10 minutes more, till golden. Cool; cut into bars.